The example site is built with node.js. It uses tedius for communication with SQL Server. Now that we know how to predict LOS, we might want to use this in real time when a patient is admitted to a hospital. This example webpage shows how you can connect to the SQL Server and perform native scoring to obtain a predicted length of stay for a patient. To start the sample webpage, type the following commands into a terminal window or PowerShell window. Now leave this window open and open the url http://localhost:3000 in your browser. A connection to the Hospital_R database is set up in server.js. If you deployed the solution using the Deploy To Azure button, the user name and password you chose has been inserted as well. Otherwise, open the file and supply your SQL username and password. 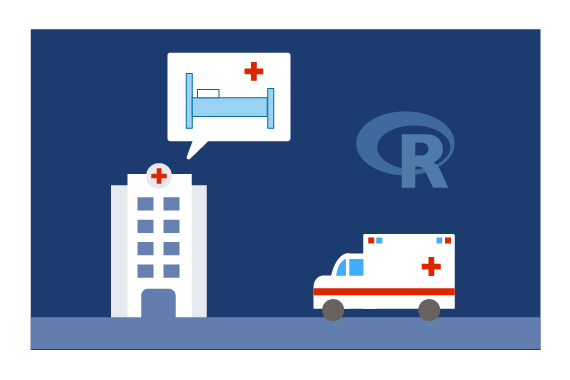 The predict function then calls the do_native_predict stored procedure with the patient id and receives back a predicted length of stay for that patient. This site is set up to mimic a hospital dashboard. Click on one of the first two patients to view their details. Select the Admit Patient button to trigger the LOS prediction. You can view the model values by opening the Console window on your browser. For Edge or Internet Explorer: Press F12 to open Developer Tools, then click on the Console tab. For FireFox or Chome: Press Ctrl-Shift-i to open Developer Tools, then click on the Console tab. On other computers, use the Public IP Address in place of localhost in the address http://localhost:3000. The Public IP Address can be found in the Azure Portal under the "Network interfaces" section. Make sure to leave the terminal window in which you started the server open on your VM.